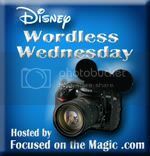 This week’s Wordless Wednesday theme is Disney Hats, Caps, Bonnets, and Bows. I think it’s one of the prettiest Disney hats! Me too! It’s so pretty! What a great princess hat!! Love it! Thanks for sharing and for joining in on the Disney WW Blog Hop fun today! Thanks for hosting it! I love getting to see everyone’s pictures! What a great set of Mickey ears – love them! That was the very first Disney hat we bought for my daughter on her first visit to Disneyland! She was only 2! I love it! How sweet! I bet she looked adorable in her princess hat!